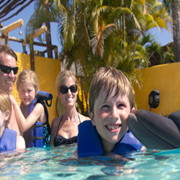 Don’t miss your chance to swim with live dolphins in our high-tech marine mammal research compound in Nueva Vallarta. Swimming in our saltwater pool environment with our resident Pacific Bottlenose Dolphins will be the highlight of your visit to the vacation wonderland of Puerto Vallarta. You will be amazed by the intelligence and friendly and playful nature of these remarkable cetaceans. Our highly-skilled English-fluent dolphin trainers enjoy introducing visitors to these brilliant and charming marine mammals. Next to primates, dolphins are some of the smartest species on the planet Earth. Our knowledgeable training staff will teach participants everything there is to know about these amazing aquatic mammals. 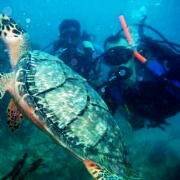 After a brief orientation, visitors will hit the pool to swim with one of these friendly creatures. Our personnel will tell you how to correspond with these bright animals through hand signals. You can tell them, through non-verbal cues, to perform phenomenal aquatic acrobatics. 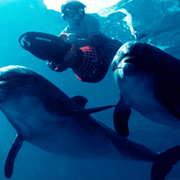 You’ll be awe-struck by the swiftness of the Pacific Bottlenose Dolphins as they swim around their saltwater habitat. 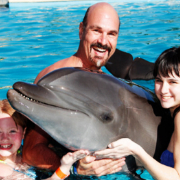 You can actually touch the dolphins; they love to have their tummies rubbed by visitors. You can embrace one and engage in a mellow dolphin kiss. These wonderful cetaceans have an extensive record through the ages of engaging with people in the wild. They have often been seen swimming beside sea-faring craft, and surfing alongside in the boat’s wake. There are countless tales about dolphins that rescue people who are drowning or shipwrecked. At our state-of-the-art marine mammal compound, we strive to continue this historic relationship between humans and dolphins. 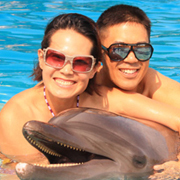 Don't miss your chance to swim alongside the playful scamps of the ocean, the Pacific Bottlenose Dolphins. The high-tech marine mammal facility located in Nuevo Vallarta provides the perfect environment for visitors to learn about these amazing cetaceans. While on vacation in the lovely vacation retreat of Puerto Vallarta, do not miss this rare opportunity to swim with some of the most interesting animals to swim in the world's oceans: the dolphins. 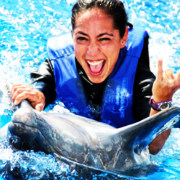 Join our veteran animal trainers at our Nuevo Vallarta marine mammal facility to swim with Bottlenose Dolphins.